1. Cowper SE, et al. Nephrogenic fibrosing dermopathy. Am J Dermapathol 2001; 23(5):383. 2. 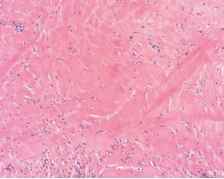 Cowper SE, Bucala R. Nephrogenic fibrosing dermopathy: suspect identified, motive unclear. Am J Dermatopathol 2003; 25(4):358. 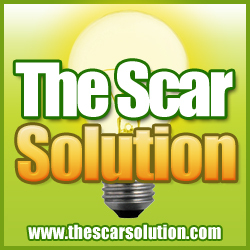 Figure 1 Scar. Mature scar is flat and hypo-pigmented. Figure 2 Scar. 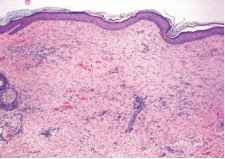 Thinned epidermis with flattened rete ridges, thickened collagen bundles parallel to the epidermis and vessels perpendicular to the epidermis, and lymphohistiocytic inflammation. Figure 3 Hypertrophic scar. Raised with a smooth, shiny surface. The scar remains within boundaries of suture marks. Figure 4 Hypertrophic scar. Thickened collagen bundles in rounded whorls and nodules. Note the increased vascularity and mild inflammatory cell infiltrate. Figure 5 Keloid. Nodular scar that extends beyond the area of injury. Source: Courtesy of Yale University, Department of Dermatology, residency slide collection. Figure 6 Keloid. Characteristic "keloidal" collagen bundles (arrows) that are thickened, brightly eosinophilic, and hypocellular. Figure 7 Eosinophilic fasciitis. There is linear induration and fibrosis of the deep dermis and subcutaneous tissue. Source: Courtesy of Yale University, Department of Dermatology, residency slide collection. Figure 8 Eosinophilic fasciitis. (A) A mixed inflammatory cell infiltrate containing numerous eosinophils (arrows) affecting the deep dermis and subcutaneous fat. (B) End-stage fibrosis and hyalinized collagen bundles. Figure 9 Chronic graft-versus-host disease. There are discrete and coalescent, hypopig-mented and pink, scaling papules and plaques. Source: Courtesy of Yale University, Department of Dermatology, residency slide collection. Figure 10 Sclerodermoid graft-versus-host disease. 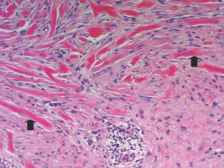 Thickened and hyalinized collagen bundles, loss of adnexal structures and inflammatory cell infiltrate. Figure 11 Radiation dermatitis. High and low power views of previously radiated areas demonstrating poikilodermatous changes, including hyper-pigmentation and hypopigmentation, atrophy, and telangiectasia. Source: Courtesy of Yale University, Department of Dermatology, residency slide collection. 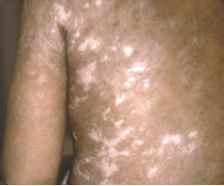 Figure 12 Radiation dermatitis. High-powered view (left) shows several atypical spindle-shaped and stellate dermal dendro-cytes (radiation fibroblasts). 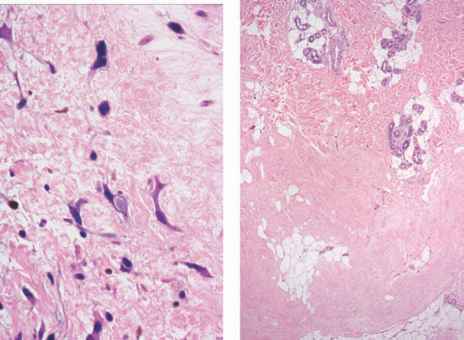 Low-powered view (right) demonstrates hyalinized collagen and fibrosis of the deep dermis, extending into and replacing subcutaneous fat. 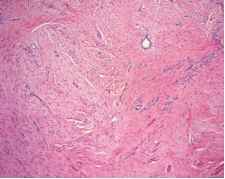 Figure 14 Nephrogenic fibrosing dermopathy. (A) Reticular dermal collagen bundles are thickened and separated from one another by prominent clefts and interposed thin collagen bundles. Spindled cells with hyperchromatic nuclei (arrows) are closely apposed to collagen bundles. (B) The CD-34 positive population consisted of elongated spindle cells that formed a dense interconnecting dermal network, entwining elastic fibers and collagen bands. 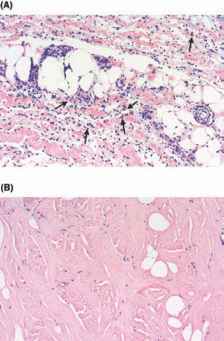 Figure 13 Nephrogenic fibrosing dermopathy. Indurated, brawny scaling plaques irregular border and cobblestoning. Source: Courtesy of Philip LeBoit, MD.